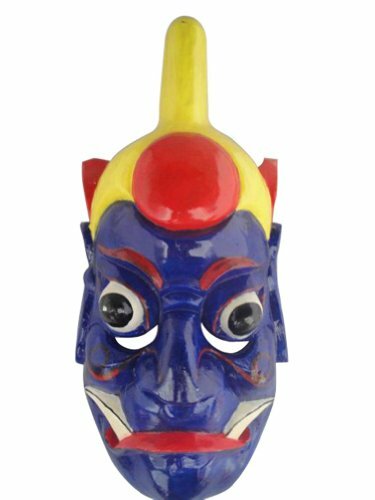 In the past, people use these masks to perform 'Nuo Dance¡¯ for ceremonies purposes. 'Nuo Dance¡¯ is a drama performance that can be traced back to Eastern Zhou Dynasty (770 - 256 B.C.). It is a ritual ceremony to pay tribute to Gods and expel the evil spirits. You will find it difficult to see this dance nowadays, except some occasional performance in the areas inhabited by minority groups living in Southwest China (Guizhou, Hunan, Yunan and Sichuan). These masks are carved in the shape of either amiable or frightening animal along with a legendary figure. Village people believe these masks could keep away the evil spirits and bring them good luck. "This very rare and aboriginal Nuo dance mask is true to life and has a great facial expression - a rare piece worth collecting indeed."